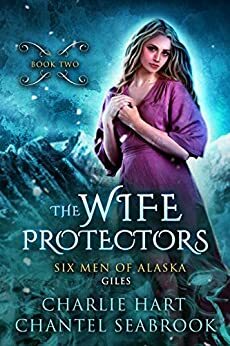 The Wife Protectors: Giles in the Six Men of Alaska series by Charlie Hart and Chantel Seabrook follow the continued story of Tia and her six husbands. Tia ran away when she thought that her past was going to catch up to her and take her away from her husbands. But running was the stupidest thing that Tia could do. She doesn’t know where she really is or even where to go to escape her past. But while fleeing a truck with three unknown men stop and try to take Tia for themselves. The men attack Tia and at gun point force her into their truck. Not long ago stories of women being stolen and raped and murdered in Alaska is brought right back to the front of Tia’s mind. Wanting to survive even though she made a bad choice, Tia decided to look for another way to escape. As the truck starts to head out, the three kidnappers are stopped by Giles. The guys have been out looking for Tia as they don’t understand why she would leave them. Giles confronts the men and when his life is put in danger, Tia responds by shooting one of the three kidnappers, killing him. Alaska with their new laws has taken all rights away from women making them hostages to their husbands. And that goes double for mercenaries that are hired by the government. With Tia having killed the man and the other two fleeing, her life is now in even more danger, but she just doesn’t realize it yet. Giles and Tia go to a cabin owned by Fallon deeper in the woods to wait out hopeful rescue by the other guys. The two finally get their chance to be together even through all the fear that Tia is going through. But once they all return home, Tia’s secret is hanging over all of the families head making the house rather uncomfortable as Tia still holds that revealing her secret will put the guys at too great a risk. Is her past coming for her, or is killing the kidnapper going to bring their family down. This time around the story is told from Giles and Tia’s points of views and the other guys all have to wait their turn. Giles seems like such a good person and the things that he has to go through in this book are sad and intense to say the least. Each of the guys act mostly justifiable in regards to everything that has happened, though like normal Hux acts worse as a jerk. The writing is done well between the two authors and nothing seems to be missed out on. The writers do a good job of showing the strife that has come down on Tia and what her actions has caused. Well thought out and well devised to know what is going on. It’s different to have the books be from only two character points of view in a reverse harem when there are seven people involved, but the way that the books are set up, this works well and is a nice change. Check out The Wife Protectors: Giles here. Read The Wife Lottery: Fallon here and check out my review.